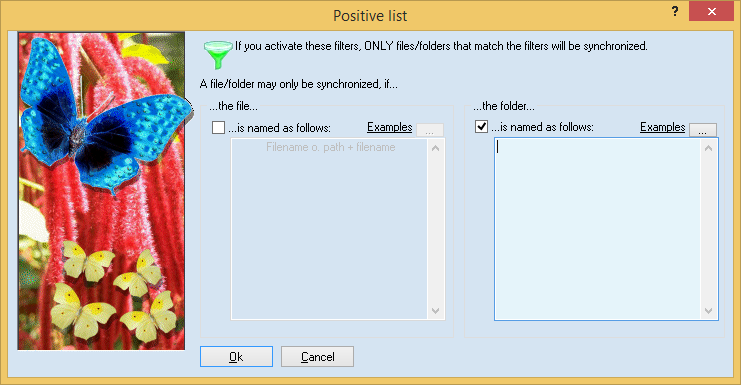 With the two boxes, you specify groups of files or directories to be synchronized. This is useful if you only want these files / directories to be synchronized. On the left, you may enter files. Simply enter a description of the file, like ’*.backup’. You may enter one description per line. On the right, you can enter directory names. The directories themselves and the files and directories in and below will be synchronized. You may enter one description per line. Note: If you enter directories, the synchronization of all other directories is deactivated. If you want to synchronize a directory in a directory, you must enter both names separately. Furthermore, if you enter a directory name this does not mean that all files in the directory are synchronized. It just means that they are not immediately excluded. Important: You may include files / directories in two ways. On the one hand, you can simply enter the name into a line, e.g., ’Backup’. All directories with this name (no matter where they are) will be synchronized (if their parent directories are on the positive list, too). On the other hand, you can also enter directory names relative to the task directory. For example, if you want to synchronize the directories ’c:\data\’ and ’\\Server\sub\data’ and you want the directory ’c:\data\test\backup’ to be synchronized, you must enter the line ’\test\backup’. It is important that you start with a backslash (’\’) and then continue with the directory below the task directories.